FINAL SALE. Feel free to wander and explore in this pretty bohemian tunic with eyelet and embroidered detail. The Wandering Eyelet Scallop Tunic is made of a cotton blend fabric and is fully lined below the waist. The best part of this tunic has to be the layer at the neckline with a scalloped hem. This tunic can be worn on or off the shoulder. Eyelet cutouts and intricate embroidered designs decorate the neckline as well as the front bottom part. This adorable tunic would look nice paired with denim and heels or wedges for a date night. You could also dress it down with flat sandals for a more casual day look. This tunic also looks great paired with leggings or even worn over denim shorts. This is a really cute summer top that comes in two color options. Details: Lined below waist. 55% ramie, 45% cotton. Dry clean or hand wash cold with similar colors. No bleach. Small measurements: Length from top of bust to hemline: 24". Bust: 32". 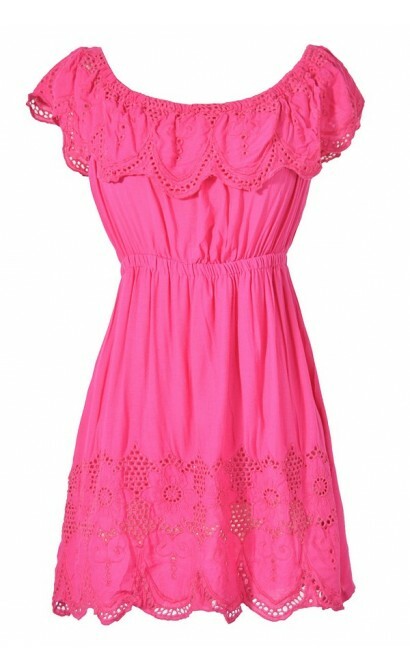 You have added Wandering Eyelet Scallop Tunic in Bright Pink into Wishlist. You have added Wandering Eyelet Scallop Tunic in Bright Pink for Stock Notification. 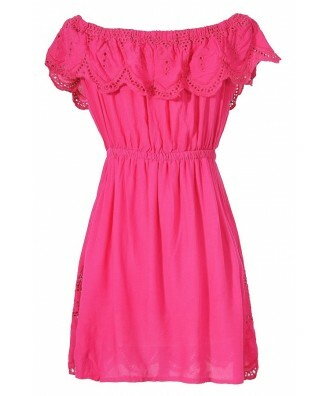 You have set Wandering Eyelet Scallop Tunic in Bright Pink as a loved product. 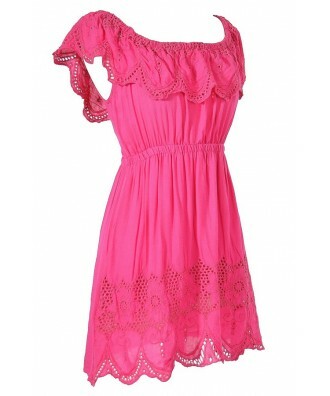 You have removed Wandering Eyelet Scallop Tunic in Bright Pink as a loved product.